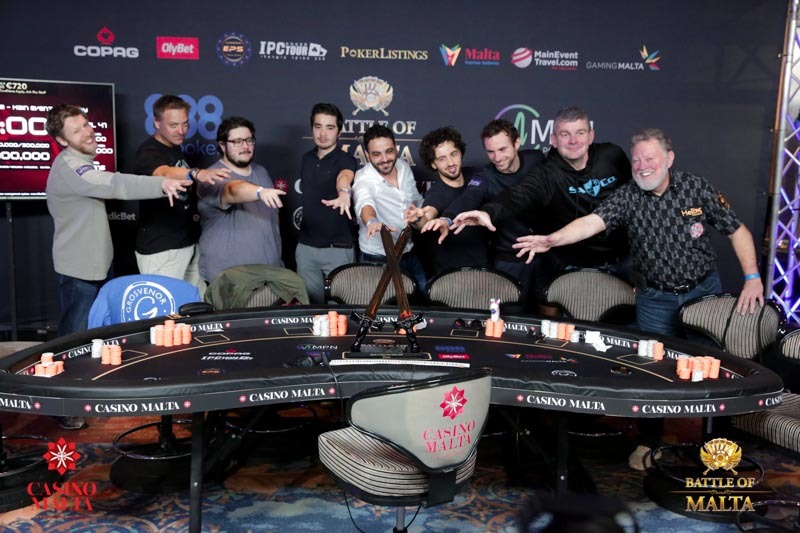 The 2018 Battle of Malta Main Event completed its quest to narrow 3,816 entries to just 1 and that sole survivor is France’s Julien Stropoli! A former Magic: The Gathering player and ascending poker pro Stropoli started the final table second-to-last in chips but showed no panic in working his way up the pay ladder. After pocketing €118,500 in a 5-way deal Stropoli calmly continued his climb up the leaderboard until he found himself with the chip lead 3-handed. After bouncing Erik Ostergaard in third Stropoli had an overwhelming chip lead going into heads-up and fought off a small charge from runner-up Maxime Canevet to finish things off. 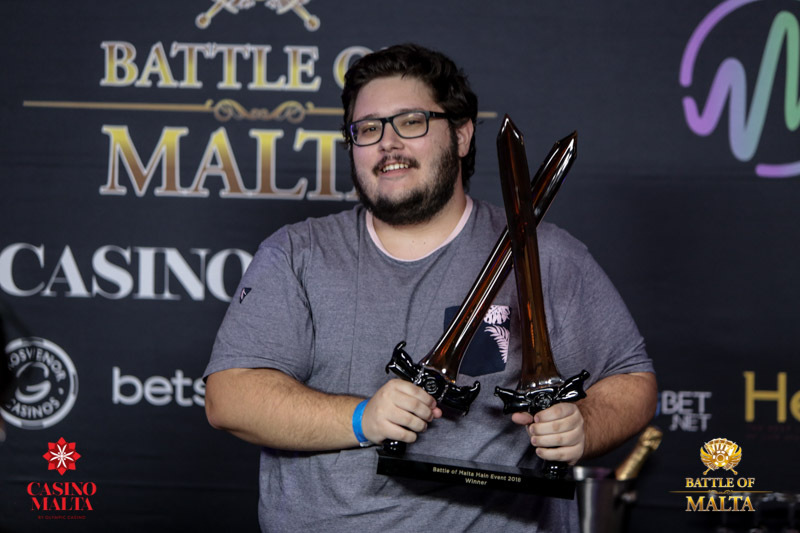 When all was done Stropoli earns €168,500 with the extra $50k to the winner plus the dazzling Battle of Malta Main Event trophy. Canevet, meanwhile, walks away with the biggest share of the prize pool at €192,000. All together the final nine split up almost €900,000! 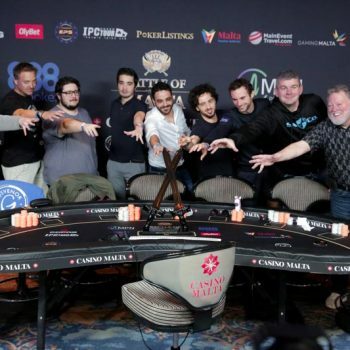 “It feels totally amazing to win this,” Stropoli said just after his win, “because I was one of the shortest stacks at the start of the final table. At that point I was just hoping to make a few pay jumps – I didn’t expect to win. The last nine players kicked off the action at 2 PM in the afternoon, and it didn’t take long until the first players had to say good-bye. Jerome Steven Mangum and Mateusz Moolhuizen busted before the first break, and Gustav Vandenbring and Andy Hills followed before the second. After that, the five remaining players agreed on a deal which secured everyone more than €100,000. Shortly after, Abdallah Fakhreddine bowed out, being the one who probably profited the most of the deal. Down to four players, Stropoli and Urbonas clashed in a huge pot that left the Lithuanian with virtually no chips. Urbonas doubled up twice against Erik Ostergaard but eventually lost all his chips to the Dane, who was suddenly for the first time the chip leader. Ostergaard later took down another, even bigger pot against former chipleader Canevet, and it now looked as if the Danish player had a real shot at the title. Instead, Canevet battled his way back up from 8 big blinds left and pushed Ostergaard into third place again. Then Ostergaard doubled against Stropoli, and we were all even again. Eventually, Ostergaard looked a little tired, and within two hands that he tried to push aggressively, he lost all his chips to Stropoli. The two French players – who both live in Malta – started heads-up play with 75 million for Stropoli and 20 for Canevet. Canevet managed to hold his own for a while but eventually fell in a hand he had no chance to get out of – see below. Julien Stropoli cashes €168,500 which is by far the biggest cash of his career. He let out a primal scream when it was done and he couldn’t wait to get his hands on the trophy even before the ceremony began. And thus ends the Battle of Malta 2018. It’s been another week full of broken records, but most importantly it was an amazing event with thousands of player who loved the experience. And we did, too. Thank you to everyone who took part, everyone who worked at the BOM, and of course, everyone of you who followed it. Why not be there next year? Payouts reflect the 5-handed deal.